Catch PB’s Heidi Hinkel and Gabe Regojo in this comedy at Unity Theatre! Have you ever been tempted to flee your own life? Becky Foster is caught in middle age, middle management and in a middling marriage—with no prospects for change on the horizon. Then one night a socially inept and grief-stricken millionaire stumbles into the car dealership where Becky works. Becky is offered nothing short of a new life and the audience is offered a chance to ride shotgun – if you had the chance to live a life you’ve always imagined and never dreamed possible – would you take it? 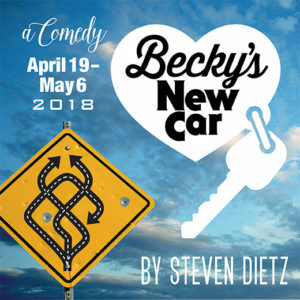 Becky’s New Car is a thoroughly original comedy with serious overtones, and a delightful drive down the road not taken.